Our outdoor swimming pool is located on the rooftop, thereby ideal for sunbathing. The area is usually breezy and is very pleasant with the many carefully selected plants and bushes to decorate the edges. Umbrellas provide shade for guests who wish to avoid the tropical sun. The pool is regularly cleaned and offers a great opportunity for a nice refreshing swim. Children are not forgotten with an adjoining little kids' pool. 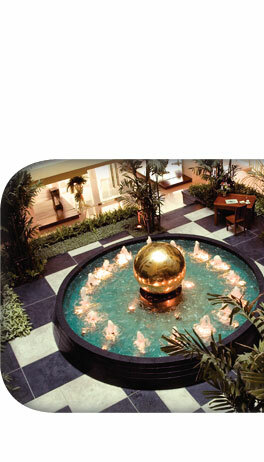 For a truly relaxing experience, enjoy our brand new Jacuzzi with its adjustable water jets. This is the perfect place to unwind after hitting a few balls at the nearby driving range. Guests who wish to work out, do some body-building or simply remain in good shape are able to take advantage of our efficient fitness centre. 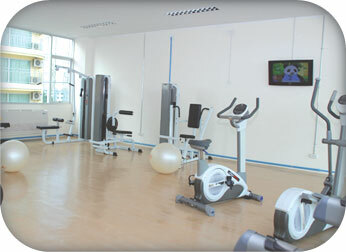 Located on the fourth floor, the facility boasts modern equipment in contemporary surroundings. The large floor-to-ceiling windows allow you to enjoy the outside view while exercising. The gear includes treadmills, exercise bikes, and dumbbells.